We decided to hold a Halloween Party again this year. The Scout Leaders very kindly left their lights, sound equipment and decorations up from their Party, which really set the tone for our evening and also impressed many parents as they arrived at Headquarters. 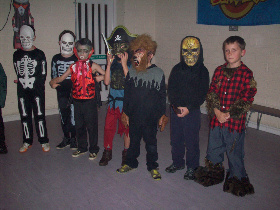 Together with scary costumes from both Cubs and Leaders, Halloween themed games rounded off with a Halloween themed buffet, it was a very enjoyable evening.